No piece of meat is too large for the grill as long as you know how to butterfly it. Some of the most committed DIY home cooks buy whole animals and break them down, but not all meat-cutting techniques require a hacksaw. One of the simplest and most useful is butterflying. The method involves taking a big, thick or even round cut of meat and turning it into a thin slab. This is essential for grilling; otherwise the meat chars on the outside but stays raw on the inside. Beef tenderloin, pork loin, boneless lamb leg—all can be cut to size. 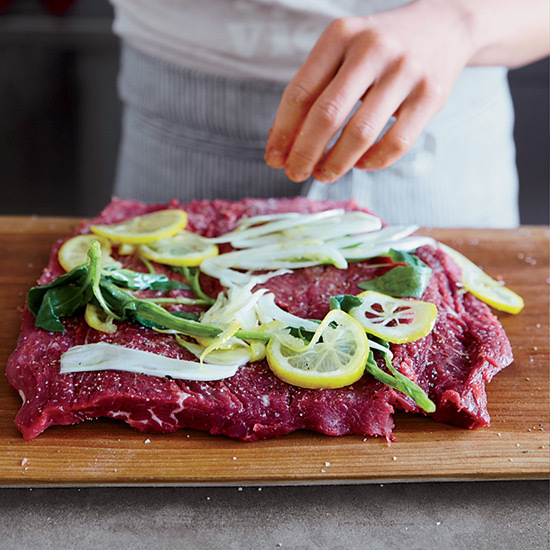 With your knife 1/2- to 1-inch above and parallel to the cutting board, slice the meat along its entire length (this will determine the cut's final thickness). Continue slicing little by little as you pull open the meat with your free hand; just be sure to keep your fingers out of the path of the blade. Keep deepening the cut, pulling the meat open as you go, until the meat becomes a slab. Each of these makes enough for 1 pound of chicken, pork, lamb or beef. Coat the meat with the marinade, cover and refrigerate for 3 hours before grilling.